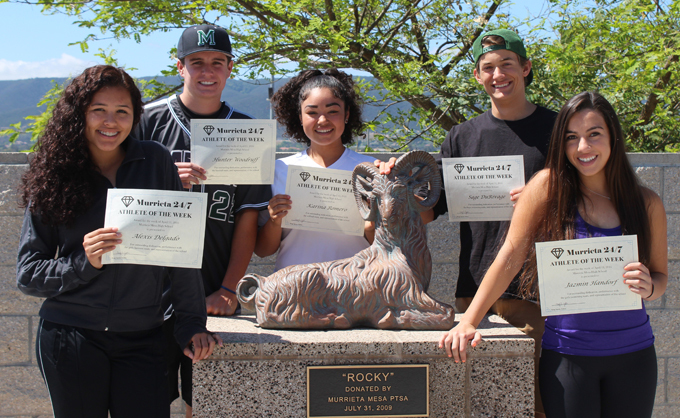 From left: Alexis Delgado, Hunter Woodruff, Karina Romero, Sage DuRivage, Jazmin Handorf. Senior first baseman Hunter Woodruff drove in half his team's runs while batting .400 last week. His hits included an RBI triple against Chaparral and a two-run single against Great Oak. The Rams are 16-4 overall. Sophomore softball player Karina Romero went 3 for 4 with the tying and winning RBIs in a game against Palm Springs. Senior defender Alexis Delgado has been a standout on offense and defense for the girls lacrosse team. "Alexis has stick skills that improve weekly and a speed that is unmatched," said her coach, Molly Sovacool. "She is a true leader on the field and in the classroom. She is the glue that holds our defense together while still being an offensive threat with 1-2 goals per game." Sage DuRivage and Jazmin Handorf were selected for their strong performances for the swimming team. These athletes will be eligible for the April Athlete of the Month award. Anyone wishing to order a glossy print of this article with photo may do so by emailing murrieta247info@gmail.com.